Save! Living the Spa Life is your direct source for hot tub filters, covers, chemicals and service parts. We are the "one-stop" source for all your hot tub filter and spa chemical needs! Save yourself the last-minute runaround. You don’t need a new spa filter too often, but when you do, it’s nice to have one ready to use. We very likely have the exact size you need and can send it to you when your order. If you purchase more than three spa filters, you may qualify for a discount (call for details). 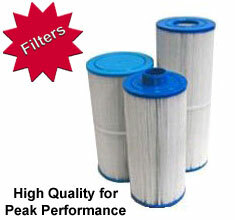 We’ll match the filter to your exact specifications when you call. Is your spa cover torn or broken? Or do you just hate the color of your current spa cover? You can have it in just a few weeks. 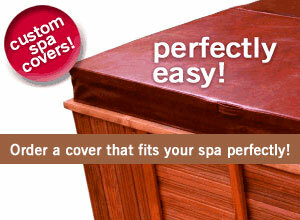 It’s easy to order a spa cover that will fit perfectly. Good covers save you money, since they reduce energy used by your hot tub. Spa Covers also reduce maintenance costs, since your spa doesn’t have to work as hard to stay warm between cycles. We guarantee your custom cover will arrive in just the color and size you ordered it, in great condition and ready to protect your spa, or we’ll redo it to match your specifications at no charge. The warranty on all covers is 5 years! One year against workmanship/craftsmanship, 5 years pro-rated against water absorption. Come back often for all your hot tub supplies and spa parts! Our hot tub professionals are at your service, ready to answer your questions and complete your order - whether you need friendly advice or know exactly what you need. We feature spa covers for any hot tub, a broad selection of spa filters and service parts, hot tub chemicals, and a variety of "must haves" and spa accessories. Order your spa supplies - including hot tub covers and cover lifts - knowing that you’ll always be assured of quality products. Our expert customer service and our selection of spa parts, hot tub covers, and hot tub filters, make us the first stop for all your hot tub service and spa maintenance, needs. Check back for sales and hot tub clearance items! Order online or call us at (800) 393-3399. Protect your investment with one of our custom fit covers. Maintain your spa by using only quality replacement parts! Everything you need to enjoy Spa Living! Maintain your spa for years of trouble-free operation! Find great bargains on our sale items page!